In the interest of time (and my sanity), this season I'm going to be doing weekly recaps of Red Sox games. Last season I did daily recaps and while it was a lot of fun and resulted in the publication of my popular book A Win For Every Stitch, it was also exhausting. This go around, I'm going to offer up bite-sized recaps of every game the Sox play in a week. Since the season just started two days ago, this first one will be short, but from here on out they'll be longer. 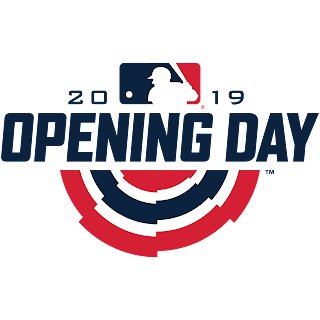 Either way, as the Sox embark upon a defense of their 2018 World Series championship, the 2019 season promises to be an interesting one...let's see how it unfolds! 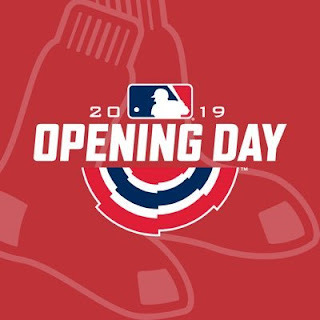 OPENING DAY (3/28 at Seattle Mariners): The defending champion Red Sox open the 2019 season with an eleven game West Coast road trip starting with a four game series against the Seattle Mariners. Chris Sale made his second straight Opening Day start for the Red Sox, but unlike last year's dominant performance which was blown by the bullpen, this year it was Sale who blew it. He gave up seven runs in three innings, including three home runs. The Sox were never in this game and were blown out 12-4. The lone bright spots were multi-hit games from Mookie Betts (3-5) and JD Martinez (2-5). The pitching was absolutely atrocious across the board and Brian Johnson, who pitched a clean eighth inning, was the only Boston pitcher to not allow a run. File this game away as one to forget, and remember...that's why they play 162 of them. (3/29 at Seattle Mariners): Postseason hero Nathan Eovaldi made his first start of the season and looked to help the Sox bounce back after the disappointment of Opening Day. Unfortunately, he was almost as bad as Sale was the night before. He surrendered six runs, four of them on home runs, and didn't look particularly sharp. Mariners rookie pitcher Yusei Kikuchi kept the Sox off-balance over six innings and only allowed three runs (two earned) including solo homers by Xander Bogaerts and JD. The Sox mounted a late comeback which included a solo homer from Christian Vazquez and the game-winning three-run blast from Mitch Moreland in the top of the ninth. Matt Barnes picked up his first save of the season and the Sox took this one in dramatic fashion 7-6. If you love the Red Sox as much as I do, you'll enjoy my book A Win For Every Stitch which chronicles their historic 2018 season from Opening Day to the end of the World Series. Click below to check it out and read some reviews...every Sox fan will love it! For baseball fans far and wide, today is one of our favorite unofficial holidays. It's the beginning of yet another season where, no matter who you root for, hope springs eternal. This could be the year for your team (unless you root for, say, the Marlins in which case sorry, but you've got no chance!). Where I live the winter weather has been stubbornly hanging on for dear life, but there are signs of spring everywhere. My kids' baseball and softball seasons are finally moving from indoor training to outdoor practices and while the weather hasn't cooperated much, little by little it's getting better. Soon it'll be warm and sunny and I'll be spending parts of every day and night at a ball field somewhere, coaching and cheering my kids and their teams on, going to some minor league games, spitting out sunflower seed shells, and playing catch, throwing grounders and fly balls, or tossing batting practice. I'll also spend the next six (and hopefully seven) months living and dying with my Red Sox as I've done since I was born and as I will until I die. So wherever you are and whoever you root for, get ready to hear those two words we've waited all winter to hear: PLAY BALL! 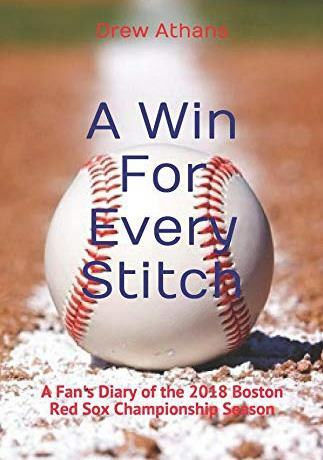 If you happen to be a fan of my favorite team, the Boston Red Sox, you might enjoy my book A Win For Every Stitch which chronicles their historic 2018 season from Opening Day to the end of the World Series. Click below to check it out and read some reviews...any baseball fan and Sox fan will love it. "There are 108 stitches on a baseball and in 2018 the Boston Red Sox won 108 games: a win for every stitch. At the beginning of the season, Drew Athans decided to keep a running diary of every game to have fun and to see if he could do it. With the Red Sox going all the way and winning the World Series, it turned into the perfect memento of an historic baseball season which he's now decided to share with all Red Sox fans. Containing recaps of every game the team played from late March when the season started to the final game of the World Series in October, A Win For Every Stitch is a book for any Sox fan. Relive all of the ups, downs, thrilling wins, and excruciating losses that made up this Red Sox season for the ages." The book is now available for you to purchase on Amazon as a paperback for $19.99 and a Kindle e-book for $4.99. As a special limited time offer, you can order a SIGNED copy of the paperback directly from me for $19.99. This is something I did for my second book and it was very popular. Just use the PayPal button above to select a copy based on your location, order, and pay (you don't need to have a PayPal account in order to purchase). Please MAKE SURE you choose the correct option and make sure to include your mailing address. For the signature, please include in the notes section of the order form any special inscription you'd like me to sign (otherwise, I will come up with my own). Be careful to choose the correct option depending on where you live: the USA price includes shipping anywhere in the USA, but for international orders there will be an additional $10.00 charge for shipping (this is based on what it has typically cost me to ship books out of the country in the past). Please keep in mind that I am a one-man operation! I am self-publishing this book and will be handling all of the shipping of orders myself, so please bear with me. I will do my absolute best to process every order as quickly as I can and will email each of you when your order has shipped. PLEASE ALLOW 1-2 weeks for your order to get to you after you place it. If you're ordering as a Christmas gift and absolutely need to have it in time, I would recommend ordering an unsigned copy from Amazon. If you want a signed copy and are okay risking the chance of it getting it to you a few days after Christmas, I will still do my best to get it to you on time. If there are any questions about the process, please let me know in the comments section below or email me at rockandrollchemist@gmail.com and I will answer immediately. Thanks and I hope you enjoy my book! Winter is nearing its end and it's almost spring, so you know what that means, right? It means that just as in 2017 and 2018, it's time for my annual ode to baseball and the upcoming Major League Baseball season. There's a lot to get into as I look back on last season before looking forward to this one. It's been a very inconsistent winter where I live; periods of bitter cold and snow followed by unseasonably warm weather, and then back to frigid temperatures. This cycle has gone on ad nauseum and by this point, despite how much I like winter I'm fully ready for spring. Since early January my son's travel baseball team (which I help coach) and my oldest daughter's high school softball team have been practicing indoors and we're all chomping at the bit to get outside onto real grass and dirt. With anticipation for my kids' seasons as well as the upcoming MLB (and by extension, Red Sox) season, this is where I'll look back at the 2018 season on both a baseball as well as a personal level. As it pertained to the Red Sox, 2018 couldn't have been any better than it was. The team rampaged through the regular season to the tune of 108 wins and the best record in all of MLB. They finally got past the first round of the postseason for the first time since 2008 with an exciting four-game series win over the hated Yankees that included a 16-1 pasting in game three. They defeated the defending champion Astros in five games in an ALCS that was filled with some truly dramatic moments. Finally, in the World Series they defeated the Dodgers in five games, overcoming a heartbreaking loss in an 18-inning epic game three to take the final two games in Los Angeles for their eighth title and fourth since 2004. It was the culmination of a season for the ages which included the most wins in franchise history and their most dominant postseason run ever (11-3 across the ALDS, ALCS, and World Series). The 2019 squad will bring almost everybody back who was a major contributor in 2018 including Nathan Eovaldi and World Series MVP Steve Pearce, both of whom came to the Sox via midseason trades and who were indispensable contributors in October. The only key losses have been in the bullpen (Joe Kelly signed as a free agent with the Dodgers and Craig Kimbrel remains an unsigned free agent) and second basemen Ian Kinsler who signed as a free agent with the Padres. In addition to everybody returning, the Red Sox will hopefully have some key contributors coming up through their farm system. So far during this Spring Training their number one prospect, Michael Chavis, has looked really good swinging the bat as has Bobby Dalbec. Young players like Sam Travis and Tzu-Wei Lin who played well in their stints with the big club have also played very well. While I'm still very concerned about the bullpen, perhaps more so than in years past given that the Sox now have no real closer (although a growing section of fans and writers seem to think Ryan Brasier will be able to step in and fill the role) this year may be the biggest test of how well the Boston relief corps can replenish itself from within. I will admit that the with the Yankees having gotten seemingly stronger through their offseason acquisitions while the Red Sox stood pat, I could very well see New York winning the division this season. However, this Red Sox team is coming off a dominating season and will be another year older, wiser, confident, and more experienced playing together. It should be another dogfight throughout the summer for supremacy in the AL East (and let's not forget about the Rays who quietly won 90 games last year). Isn't that all we could ever want as baseball fans, for the Red Sox and Yankees to both be good so that the games mean something? I know I can't wait! On a personal level, the 2018 Red Sox season was one of the best in my life. While it of course wasn't as life-changing (at least as a sports fan) and cathartic as 2004, the 2018 season brought so many new experiences and positive changes to my life that I'll never forget it. First and foremost, the running diary I kept of the entire season from March to October resulted in my third published book and perhaps the one I'm most proud of, A Win For Every Stitch. I've written about it a few times on this site and I don't want to belabor the point, but it's a book I'm very proud of and one that so far has been 100% popular with readers and customers. Sales have been great but what humbles and excites me the most is when I get messages and emails from fans who tell me how much they love the book and how it brought back such great memories of last season. The book, all of the work I put into it, and the Red Sox themselves also led to a lot of other cool new things that happened in my life in 2018. I wrote about these in the book, but they include writing for Guy Boston Sports, two of my kids and I getting to meet Mookie Betts at his baseball clinic, and all of the opportunities opened up and the people I met because of my baseball writing. One question I've been asked repeatedly since A Win For Every Stitch was released was whether I'm going to write another book on this upcoming season. The idea hadn't crossed my mind and it certainly wasn't my intention to follow it up with another book on the Red Sox. I've acknowledged in the book as well as on this site that I was exceptionally fortunate that the season I chose to challenge myself and write about ended up being the greatest season in franchise history and culminated with a World Series championship. It all ended up being so perfect and honestly, I'm not sure how I could ever top it. However, there is something intriguing to me about the upcoming 2019 season since the Red Sox are returning pretty much the entire team that won it all intact and will be trying to not only defend their title, but become the first team since the 1998/1999/2000 Yankees to repeat as champions. I haven't yet decided if I'll do it, but if I do I may keep it quiet to see either A) how long I keep it going (remember the out I gave myself last year?) or B) whether or not this season ends up being interesting enough to warrant another book. Regardless of whether I write another book about the Red Sox or not, I cannot wait for this season. Along with my kids' baseball and softball teams finishing up their indoor workouts over the next few weeks before we get outside onto real fields (weather permitting), the winter which has been dragging on and on for the last few weeks should hopefully be coming to an end as spring, warmer temperatures, and the promise of new seasons both amateur and professional gives me hope and optimism as it does every year around this time. There's a old saying that I've always liked that says "baseball is the only game that can make a kid feel like a grown man, and a grown man feel like a kid." A related quote is that "you can be a kid for as long as you want when you play baseball." There's just something special about this game and about this time of year that has always filled me with excitement. Having kids who are as into the game, both watching it and playing it, only makes it more special to me. No matter who you root for, it's all about hope and the promise that this might be the year for your favorite team. With that, I wish you and your team the best of luck (unless it's the Yankees!) and since it's my blog, I'll close with an exhortation of my own: Go Sox! To everyone who is about to go all crazy after reading my headline, I ask you to give me a moment to make my case in this post. Yes, I know it's spring training and yes, I realize that these games don't count. Teams are usually playing their fringe major league/AAAA guys and trying to get a look at what they have in every level of their farm systems. The regulars don't usually play more than a few innings a game and the pitchers throw even less. You can never gauge how well a team is going to do in the regular season based on what they do in spring training, and the Red Sox are bringing back the team that won 108 games and a World Series almost completely intact. Everything will be fine, right? Normally I'd agree, but for some reason the longer this spring goes on the more of a bad feeling I'm getting about the Sox. With a 6-13 record, Boston sits dead last in the Grapefruit League standings a year after winning it. The Sox have said and (seemingly) done all the right things, but it hasn't translated at all to the results on the field. Is it the offense that I'm worried about? Not really. The potent Red Sox lineup that rampaged through the regular season and went 11-3 in the postseason returns almost completely whole. Reigning AL MVP Mookie Betts, near-Triple Crown winner JD Martinez, Andrew Benintendi, ALCS MVP Jackie Bradley, World Series MVP Steve Pearce, Xander Bogaerts (after a career year), and Mitch Moreland all return healthy and ready to go. Rafael Devers has another year of (hopefully) maturation at the plate and in the field under his belt while the team waits to see what, if anything, they might get from the returning Dustin Pedroia. These guys have been working on their hitting all spring and besides, at best they're usually only getting a couple of at bats per game before sitting to let the young guys play. They may hit from the very first pitch of opening day or they may start slow, but they'll be fine. Is it the starting pitching that's causing consternation? Nope. Again, they return the same rotation that bulldozed through the league with a healthy Chris Sale, David Price, Rick Porcello, Nathan Eovaldi, and a seemingly rejuvenated Eduardo Rodriguez. These guys have been throwing and working all spring and like the hitters, they're usually only throwing a few innings a game to keep them fresh and get their arms into shape. Once the season starts, they should be fine. That leaves the same thing that has been a bugbear of mine for the last several years: THE BULLPEN. If you read any of my posts last season (or my new Red Sox book), this will come as no surprise to you. Mark my words, if the 2019 Red Sox fail to mount a strong defense of their World Series title (or even their AL East title), it will be because of their horrific bullpen. Despite the numbers, the Red Sox bullpen in 2018 wasn't great if you actually watched them on a day-in/day-out basis (which I did). The Sox led the league in runs scored and had a potent offense, so more often than not the pen pitched from ahead with a lead which masked a lot of their issues and made the numbers look better than they were. This year they bring back almost the entire bullpen from last year minus their best reliever from October (Joe Kelly) and their closer who was awful in October (Craig Kimbrel). What's left? Tyler Thornburg looks even worse this spring than he did last season...a bust and proof positive that the Sox once and for all lost the Travis Shaw trade. Ryan Brasier had a delay to his spring because of an infected toe (no, seriously). Brandon Workman, Brian Johnson, and Hector Velazquez have looked lousy, Steven Wright is suspended 80 games for PED use, Matt Barnes has been inconsistent (what else is new? ), Heath Hembree (my personal least-favorite) has barely pitched (which is actually a plus), and Carson Smith is still rehabbing the shoulder he injured by stupidly throwing his glove down too hard in the dugout last year. There isn't any major league-ready help coming from the farm system (or at least any quite yet) and what all of this leads up to is a bullpen that looks EVEN WORSE than 2018. By and large I've been a fan of how Dave Dombrowski has constructed the team and obviously the results of the last few seasons (and especially 2018) speak for themselves, but the one thing he has done an atrocious job of since he was hired in 2015 is building a quality bullpen. He seems to either willfully neglect it or be downright delusional when evaluating the talent they have in there. Given the abysmal track record Boston has in developing pitchers from within over the last 10-15 years and with the quality guys they chose to pass on signing this offseason (a couple of whom ended up with the Yankees), it looks like we could be in for a long season of blown leads and losses snatched from the jaws of victory with this sorry crew. Maybe Mookie, JD, and Xander don't come close to the monstrous seasons they had last year. Maybe the starting rotation has a down year. Maybe the Yankees are just too good and the Sox can't keep up with them this year (I don't think any of us expect the Sox to win 108 games again this year anyway). But if I were a betting man (and I'm not), I'd put good money, and a LOT of it, on the bullpen being the reason the Red Sox don't repeat the success of 2018 in 2019. I guess we'll find out starting next week. If you'd like to relive all of the excitement and memories of the incredible 2018 season, my book A Win For Every Stitch will take you back to that historic year! "This is where your skills as a writer will not matter as much, while your skills as someone who can connect with your audience and create interest and excitement for your book are of paramount importance. The hard part of creating and executing your book are finished, and now you've got boxes (or access to boxes) of copies and copies of your book. But you didn't put in all of that work just to sit on copies of your own book; you did it because you had something that was important to you that you thought would also be important to a lot of other people which you want to share with them. Well, the only way that's going to happen is if you put in the work to get those copies into the hands of your future readers! Right off the bat, I want to emphasize the point that there is a fine line between being a good salesman and promoter, and coming across like a huckster. Your target audience and any potential fans will be instantly (and 99% of the time, irreversibly) turned off by an approach that makes it obvious that you're simply trying to get them to buy your book. Even worse is if you make it obvious that you're only interested in their money. Honestly, and this is speaking from personal experience, that's not why we write books and are so eager to get them into the hands of our readers. While it is, of course, nice to be rewarded for your hard work and dedication, it shouldn't be (and hopefully isn't) the only motivation for doing it." - ...been more aggressive in my efforts. Aggressive doesn't mean obnoxious and in everyone's face, but it does mean to be more persistent and engaged. I post about my new book more frequently than I ever did my previous books, I've broadened my net in terms of where I market it, and I try to engage with potential readers and customers much more than I ever have in the past. For the most part this has worked really well and I've attracted a lot of readers and customers. I've enjoyed engaging with them all and most rewarding of all, I've loved the unsolicited positive feedback I've gotten from fans regarding the book. What's even nicer is that many of my satisfied readers recommend my book to other fans which has created a positive feedback loop of good reviews and interest. The one downside to my more aggressive marketing approach? I've been kicked out of a few of the Red Sox/baseball Facebook groups I post in, some because they have strict no-advertising policies that I didn't know about and some because I guess I just irritated the administrators! It goes completely against my nature as a person to self-promote and draw attention to myself, so I've had to really step out of my comfort zone to market this way, but the results have been undeniable and I continue to refine my approach. - ...been more creative in how I market. Rather than sticking solely to Facebook groups in my niche (which is all I did for my first two books), I've been branching out into other ways of marketing. I still predominantly use Facebook, but I've upped my efforts on Twitter and (especially) Instagram. I've also looked to not only promote in the obvious baseball and Red Sox fan communities, but in independent author and self-publishing communities as well. These are huge groups of like-minded people all trying to do the same thing and supporting other independent writers in the efforts to spread the word about their books. I've found that while I haven't necessarily seen a spike in sales, the networking aspect has proven invaluable in connecting me with other writers of similar interests. I've also tried to think outside the box a bit, reaching out to my university's alumni association as well as local newspapers and websites. I've had varying degrees of success, but it's been fun and different and I've learned a lot about what works, what doesn't, and why. Those are the two biggest things I've learned about book marketing this time around although there are always little lessons picked up along the way. Your mileage may vary with these, but at the very least between my original article and this update, you should have some starting points for how to effectively promote your book. A Win For Every Stitch has been by far my most successful book in terms of popularity and sales. I won't divulge exact numbers but just since its release in December I've sold hundreds of copies, both through Amazon and directly (I offer signed copies directly at no additional charge). I've found that some people prefer the convenience and speed of Amazon while some prefer the personal touch of a signed copy and dealing directly with me. Both have been great for me and I will continue to use both approaches. As I learn more (and I'm sure I will), I'll continue to update this series. I'd also love to hear from all of you out there who have gone through the same thing: what's worked for you? What hasn't? And what advice do you have for effectively marketing your books? Please let me know so we can help each other out! A Win For Every Stitch Has Cracked the Top 100 on Amazon! Since this is my blog, I figure I'm allowed to brag a little bit on here from time to time. In late December a few weeks after it was released, the Kindle ebook version of A Win For Every Stitch was the #1 New Release on the Kindle charts. Sales have been steady and increasing at a nice clip since then, good for the Kindle version but even better for the paperback. I've been selling a TON of signed copies of the book, but as I've seen my Amazon paperback sales increase I had a goal of cracking the top 100 baseball books. 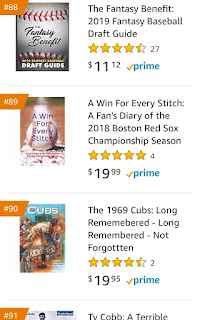 That finally happened this past weekend when A Win For Every Stitch hit #89 on the Amazon top 100 baseball books. Given the thousands of books they sell on the sport, to say I was both thrilled and humbled would be an understatement! More than anything, I'm just happy that enough people are enjoying the book...it's got 100% positive five-star reviews as well, so I must be doing something right. I apologize for bragging a little bit, but I thought it was pretty cool! Today is a special yet somber day for me. It's my late grandfather's birthday and this year marks ten years since he's been gone. It's always hard when a loved one passes away, but for me I'm reminded of it every year around this time when baseball and spring training are ramping up. You see, my grandfather is a huge reason why I'm such a massive baseball fan. I wrote about it at length in my book A Win For Every Stitch, which I also dedicated to him, but for anyone who hasn't read the book he was quite simply not only my grandfather but he was my buddy. He was a massive Yankees fan due to his being born and raised in the Bronx, but even though he loved his team he was also just a huge fan of the game. Some of my earliest baseball memories are of watching games with him in the den of my grandparents house and listening to him talk about the old Yankees teams he'd seen. I learned a lot about the game and its history from my grandfather (as well as some choice phrases for those frustrating moments as a fan!). He always asked me how my baseball teams were doing when I played and any time he and my grandmother were visiting us, he'd come to the ball field to watch my games. Even when I played in college, he'd ask how I did and if my team won, just like he'd done when I was younger. Being a Red Sox fan, there was always a lot of good-natured ribbing between the two of us especially since his Yankees tended to win more often than not. The Red Sox crushing defeat in the 2003 ALCS was avenged by their stunning comeback in the 2004 ALCS and I'll never forget my grandfather marveling at it. He tipped his cap to Boston...I remember his words were "they finally beat the Yankees when it mattered!" He was happy to see the Sox finally win the World Series that year, although I've never been sure if he was happy for the team or just to see me so thrilled. (He always did say since he lived in New England, his second favorite team was the Red Sox, but never when they were playing the Yankees!). 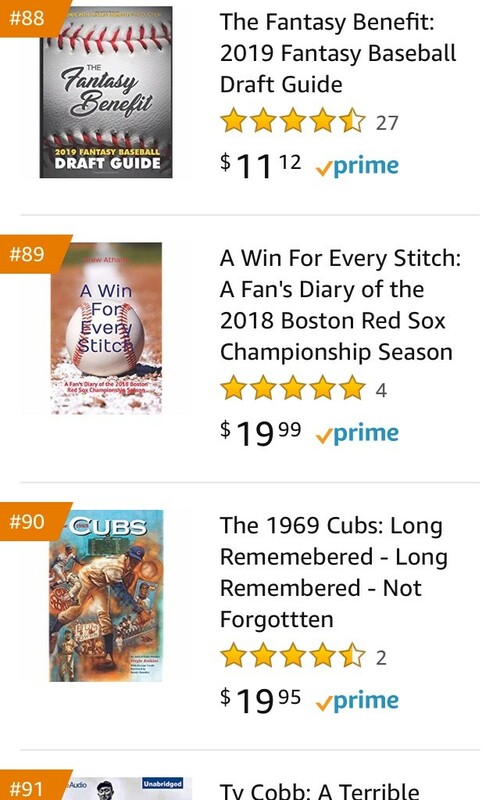 If you'd like to read a little bit more about the baseball memories I have of my grandfather as well as about the Red Sox amazing 2018 season, it can all be found in my book A Win For Every Stitch. It's available in paperback and Kindle e-book on Amazon below.